October 13, 2011 Masculine leaves. 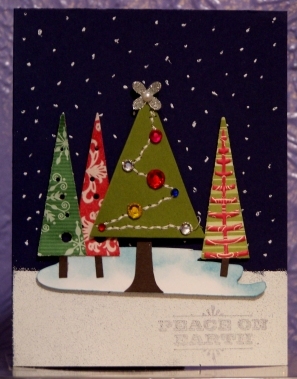 However for my card I chose to go with a Christmas holly instead of fall leaves. I used the Stampin' Up! set Peaceful Season to create my card. 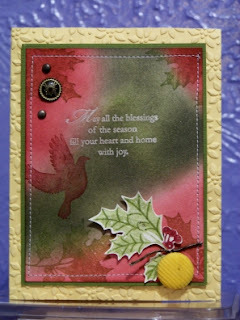 The embossing folder used is SU Petals A Plenty. Inks used are SU Cherry Cobbler, Always Artichoke and Lucky Limeade. My brad is a corduroy button brad from SU. The second card I CASE-D was drawn from the Nov/Dec 2011 issue of PaperCraftsMagazine pg. 34. Hope you like my offerings for today. I sure had a good ball of fun creating them to share with you. If you like what you see or have any questions please feel free to e-mail me or leave your question in a comment. THANKS! Betty, both cards look great! I am flattered that you liked my card enough to case it.